Ho Ho Ho and happy holidays from the Kahne lab! We wish everyone a safe and joyful new year. On October 23, the Chemistry and Chemical Biology Department (CCB) at Harvard University hosted its second annual Fall Festival. Several Kahne lab members joined in on the festivities which included a pumpkin carving contest, mini pumpkin decorating, and plenty of seasonal treats such as candy, donuts, and apple cider. Alan Yang, a 2018 Harvard College graduate, recently stopped by the Kahne lab to catch up with his fellow lab members before traveling to the University of Oxford this fall. Alan has been an undergraduate member of the Kahne lab since 2015 and was recently awarded a Rhodes Scholarship to pursue graduate degrees in integrated immunology and migration studies. Read more about his Harvard experience and his future plans here and here. Congratulations and best wishes, Alan! 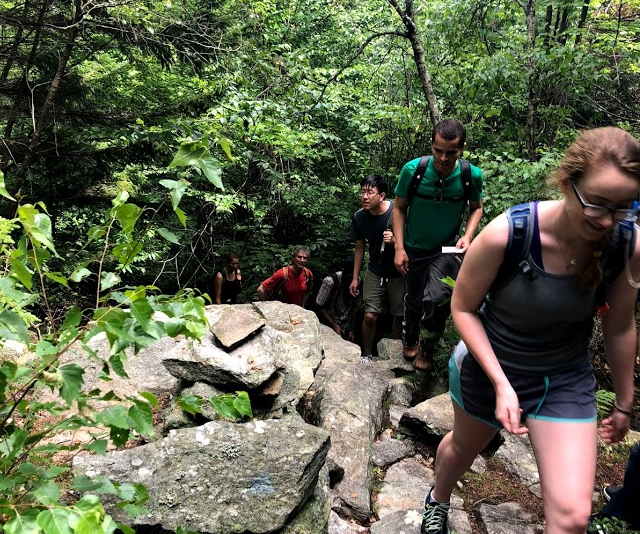 On Friday, July 27, several lab members traveled to New Hampshire for a day of hiking on the Wapack Trail. The group hiked over six miles and enjoyed a picnic lunch. On Sunday, March 11th, four lab members represented the Kahne lab in the Rás na hÉireann USA 5K race. Lab administrator Mike Quinn and graduate students Mary May, Aurelio Mollo, and Becca Taylor all participated in this annual tradition celebrating the area's Irish heritage and the start of spring. Several other labs from the Department of Chemistry and Chemical Biology also fielded teams for this event and the Kahne lab team earned the second highest score among CCB teams. You can read more about the Rás na hÉireann USA 5K here. Congratulations to Mary, Mike, Aurelio, and Becca!